"Barton Arcade may be said to form a part of the Deansgate improvement, the principal front of the building looking into that street, and the rear forming a covered promenade lighted by a lofty dome-roof of glass. 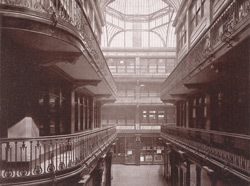 The ground floor is occupied by shops, and the upper stories are let for offices, each story being approached by an external gallery, protected by a light iron railing, continued round the entire arcade." Text by James Croston from his book entitled 'Manchester As It Is'.